India is at the forefront of building an ecosystem that encourages innovation in digital financial services for low-income customers. New technologies have created new opportunities to expand access to financial services and empower consumers. But many digital solutions are slow to scale as consumers often distrust what is unfamiliar. Building trust with low-income consumers underpins the success of any digital financial product. So, from product design to product delivery, how can financial service providers build and maintain customer trust in digital solutions? Tailored to Indian fintech startups, financial institutions, investors and development practitioners, join Catalyst Fund for an afternoon for a panel discussion and workshop on how to design for trust in digital financial services along the customer journey. Workshop: How to design for trust in DFS? The workshop explores the key elements of trust in digital financial services and how companies can integrate it at every step of the customer journey. Participants will walk away with practical tips on how to create customer trust from product design to product delivery. This event is organized by Catalyst Fund, J.P. Morgan and BFA and is by invitation only. Contact us to request invitation here. Catalyst Fund in partnership with JPMorgan Chase & Co, is hosting the first spotlight on inclusive fintech at SOCAP. SOCAP is the world’s leading conference on social capital markets—a gathering where powerful ideas are sparked and game changing partnerships get started. The conference brings together social entrepreneurs, impact investors, funders, business leaders and other innovators and problem solvers from across the world. Now in its 10th year, SOCAP is a catalyst for much needed change, creating a vibrant market for ventures that support people, planet, and profits. Risky business: How can we lower risks to scale innovative fintech companies? One of the key challenges for impact investors is figuring out the level of risk involved in early-stage companies. But what if that risk could be somewhat removed to pave the way for more money to flow in innovative solutions? In this session investors and startups of Catalyst Fund will discuss ways to de-risk investments in fintech startups in emerging markets by working with a group of like-minded investors, funders, entrepreneurs and fintech specialists. FinTech innovators have the potential to increase access to, improve the quality of, and reduce the cost of financial services for the underserved at scale. But to scale successfully, they need access to different kinds of capital in their growth trajectory. This session explores the capital and resources needs of inclusive fintechs. Startups at different stages of venture development, funders, and investors speak to the challenges of identifying the right capital at the right time. Artificial Intelligence is today’s buzzword. AI has the potential to reduce costs, boost client engagement and improve business decision-making. When targeting low-income customers, AI can mean better-margins, higher employment rates and manageable fees on financial services. But how is AI currently benefiting fintech companies and what challenges are they encountering? This session covers how fintechs, financial institutions and Silicon Valley investors view AI’s potential in global financial services and the implications for low-income customers. Trust is the backbone of business success and it is ever more important when offering digital financial services to low income customers. From product design to product delivery, how can startups build and maintain trust with their customers? This panel discusses the key elements of trust building in inclusive product design, the challenges faced by early stage companies and a roadmap to build trust along the customer journey. Since 2015 the Financial Solutions Lab has supported 27 companies who are building products that improve the financial health of American consumers. Companies from the Lab's first two graduating classes raised over $135MM in follow on capital and are now serving nearly 1.5MM Americans. This session will explore some of the learnings and insights from this program which will have relevance for grant-makers, investors and entrepreneurs Featuring founders from the Lab, the session will highlight how technology is improving the financial health of American consumers through innovative distribution and servicing models that open up new markets and could have broad long-term implications on the U.S. financial services industry. Colleen Briggs, Executive Director of Community Innovation, Office of Corporate Responsibility at JPMorgan Chase & Co. The Good Capital Project (GCP), the next step in bringing impact investment into the mainstream. Through a design thinking process, the GCP will convene and leverage expertise from the financial, design, academic, non-profit, governmental and impact communities to drive greater collaboration, partnerships and accelerate capital flows into purpose-driven investments. The project will focus on generating innovative and sustainable solutions to align the capital markets with the human needs of tomorrow. Catalyst Fund is supporting the upcoming CEO Forum & Fintech for Inclusion Global Summit 2017, organized by Accion Venture Lab and Quona Capital and hosted by FMO, taking place in the Hague, Netherlands, from June 21st to 23rd, 2017. Catalyst Fund investees Destacame.cl, Escala Educación, PayGo Energy, Atikus, Grafica, Comunidad4Uno, Harvesting and Paylatr will be in attendance. A closed-door gathering of CEOs or other C-level representatives of portfolio companies of Venture Lab, Quona Capital, FMO, and Catalyst Fund that are advancing financial inclusion through their products and services. The CEO Forum will provide participants with opportunities to engage in practical discussions, openly speak about successes and failures, and share learnings in areas such as sales, partnerships, recruiting, fundraising, and scaling. In addition, the Forum will offer valuable knowledge-sharing, development opportunities, and industry insights – all of which are sought by resource-strapped startup management. The Summit, to which investors, thought leaders, experts, key market participants and other fintech CEOs will be invited, will consist of dynamic exchange of insights and network building between these leading actors in the fintech for inclusion space. Participants represent companies and institutions whose products and services or investment focus cover a variety of themes and business models such as small business and consumer digital lending, alternative credit scoring, payments, and other enabling technologies. With the attendance of over 150 selected fintech startups, investors, financial services and other industry leaders, the Summit will enable a robust exchange of ideas and to yield concrete opportunities for collaboration and partnerships across borders and sectors. Join Catalyst Fund at the AI for Good Global Summit for a plenary on AI for Common Good and Sustainable Living. This session will explore how AI can accelerate and advance the development and democratization of solutions to promote common good and enable sustainable living. Our Data and APIs Manager, Matt Grasser will be speaking at the AI for Prosperity panel. XPRIZE believes Artificial Intelligence will be central to solving humanity's grand challenges. Solutions to pressing problems related to health and wellbeing, education, energy, environment, and other domains important to XPRIZE can be found by capitalizing on the unprecedented quantities of data and recent progress in emerging AI technologies. 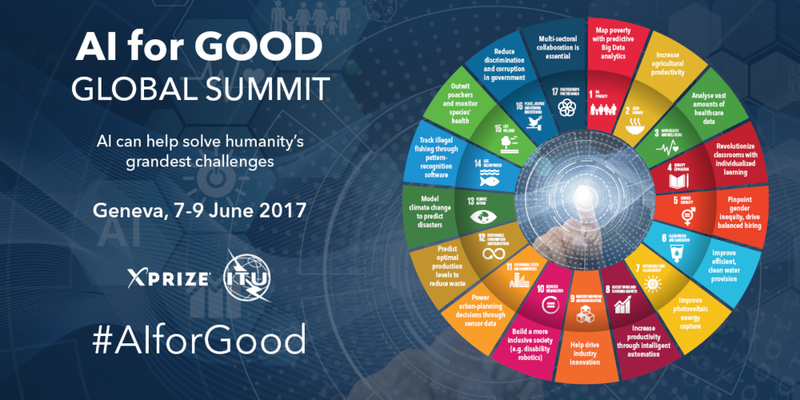 To support our mission to build a bridge to abundance for all, XPRIZE is, together with the United Nations (UN) specialized agency, the International Telecommunications Union (ITU), hosting the inaugural AI for Good Global Summit, in Geneva Jun 7-9, 2017. This annual summit will gather government officials, UN agencies, NGO’s, industry leaders, and AI experts to address how artificial intelligence can help achieve the UN Sustainable Development Goals (SDG) and design a first UN-backed “AI Guiding Principles” to provide guidelines on ethical, technical, standardization, societal and policy issues related to AI. What have we learned about catalyzing inclusive fintech startups so far? On Feb 15th, the Catalyst Fund hosted a panel about supporting early-stage inclusive fintech companies at FLII 2017 (The Latin American Impact Investing Forum). Held in Mérida, Mexico and in its seventh year, FLII brings together investors, entrepreneurs, nonprofits and other ecosystem players working hard to bring real impact in Latin America. The panel, Catalyst Fund: Our Approach and the Lessons Learned from Supporting Inclusive Fintech Startups, covered how the Catalyst Fund model compares to other accelerators or incubators and more specifically, how Catalyst Fund tailors its advisory engagements using a range of startup tools all the while rolling up their sleeves working alongside the startup teams. Speaking were some Catalyst Fund investees: Jorge Camus from Destacame.cl, Miguel Duhalt from Comunidad4Uno, myself, Jonathan Duarte Escala Educación, Catalyst Fund partner Mathieu Albrieux AccionVenture Lab and moderator Gabriela Zapata from BFA. Read full post on our blog. Early stage inclusive fintech startups, in developed and emerging markets alike, have a hard time securing the capital and expertise needed to test their ideas and bring products to market. They’re too early for most investors, but their ideas have great potential to scale. What solutions exist to support them? Three innovative accelerators are helping fintech startups pioneer transformative businesses that empower the poor. Join us to hear from Catalyst Fund, the Digital Financial Services Innovation Lab (DFS Lab) and the Financial Solutions Lab and how they are supporting fintech startups around the world to spur innovation in financial inclusion. Catalyst Fund, supported by BMGF and JPMorgan Chase & Co, aims to accelerate innovative fintech startups delivering digital financial services to low income customers in emerging markets, through seed grant capital, hands-on advice and mentorship by a group of impact investors. Digital Financial Services Innovation Lab (DFS Lab) is an incubator for high-potential entrepreneurs working to introduce innovative FinTech solutions to the developing world. Via tailored guidance and hands-on support from leading experts, the organization helps refine, grow and launch businesses that can transform the lives of the poorest, profitably and at scale. The Financial Solutions Lab, managed by CFSI and supported by JPMorgan Chase, is a US-based community of startups, financial services companies and nonprofit organizations building solutions to improve the financial lives of Americans.